Until my mom pulled Autobiography of a Yogi off her shelf, I had been an avowed atheist. I remember as an eight year old playing with some friends and telling them with contrarian glee that I didn’t believe in God. The idea of God -- some white-haired, bearded old man sitting on a throne of gold in the sky -- made no sense to me. So, I rejected it. Since there was no other conception of God that I was aware of, I figured I was an atheist. Swami Yogananda changed that. His Autobiography (which you can read online here) introduced me to a more complicated, personal and natural conception of the divine -- one that would shape the rest of my life. The first thing about Autobiography that grabbed my attention was Swami Yogananda’s picture on the front cover. He’s beautiful. Even as an insecure 13 year old boy I could admit that. Swamiji radiated beauty. Despite his long hair and orange gown he didn’t project an effeminate vibe. Plus, inexplicably, Swamiji seemed familiar to me. Then there were the stories: the saint with two bodies, the “perfume” saint, the levitating saint, the tiger swami. I ate these stories up. Over the next few weeks I’m sure that my re-telling of them to Brett and Charlie grew tiresome. I couldn’t help myself though. The young Swami Yogananda’s urge to escape the world and his search for self-mastery -- his search for a spiritual master -- resonated with me in the most powerful way. One chapter in the book, however, stood out from the others: The Blissful Devotee and his Cosmic Romance. If it was Swami Yogananda’s intent to use Autobiography to catch devotees, then the stories about miracles and saints acted like chum in the water to me. 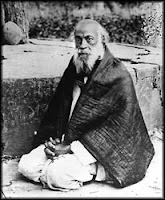 I wasn’t actually landed, however, until I read Swamiji’s reminiscences about Master Mahasaya (pictured). For it was at that point in the book -- through the intercession of Master Mahasaya -- that Swami Yogananda says that he had a vision of the Divine Mother. That idea floored me. First, that through meditation one could actually see the divine. Second, the “Divine Mother”! The idea suggested intimacy with the divine that I’d never conceived of before. It would be some years still before I recognized the great appeal of Master Mahasaya for what it was: the reflection of his own spiritual master Sri Ramakrishna. Over the next few weeks, however, I raced through the rest of Autobiography and at the end was left with a profound sense of loss. Not just because I had finished the book -- probably the first book I had ever read voluntarily and undoubtedly the longest book I’d read period. I honestly felt that at 13 years old I had missed the boat. One night, shortly after having finished the book, my mom took me to dinner at the Live Oak Kitchen, a local pizza and salad place. Over dinner, I cried openly about my sense of loss and frustration at having squandered my life. While I had been drinking, smoking pot and getting into trouble at my young age, Swami Yogananda had spent his waking hours looking for God. I couldn’t shake the picture of Swamiji as a six year old (pictured), sitting cross legged and apparently already meditating. I was more than twice that age, I lamented. There was no hope for me to realize God in this lifetime. Mom, to her great credit, took me seriously and tried to console me. I was still three years away from meeting my own master. In the meantime, there would be more drinking, smoking and trouble. While Autobiography of a Yogi planted the seed in me, there was a need for a little more "fertilizer" in my life before that seed would sprout. Shortly after David Moretti's act of courage, I went to live with my dad for a year, which required me to change schools for sixth grade. By the next year though, I was back living with mom and attending Union Junior High School in San Jose. At Union I played football, wrestled, ran track, and in the process made new friends, the best of whom was Brett Jackson (pictured above). I met Brett on the track team. He was a middle distance runner who went on to set the school record for the half mile. Sadly, a few years later Brett would move away to Alaska with his family, where he suffered a horrible bike accident which left him severely disabled. Brett's physical problems were later compounded by negligent medical care, for which he was eventually compensated. Unfortunately, however, it resulted in his early death. While at Union though, Brett introduced me to a new friend of his: Charlie (pictured below, right). It was through meeting Charlie that my inner life was about to get a kick start. Charlie transferred to Union in the eighth grade after his junior high school folded. Charlie had come from Hogue Junior High. That fact left a bad impression on me because I had wrestled against Hogue (pronounced "Ho-Gee") students the year before and didn't like them. They wore dark uniforms, and while wrestling, they squatted close to the mat with their hands hanging down like they were primates -- swinging back and forth brushing the mat, menacing. The ceiling of their gym was decorated with in-your-face aphorisms like, "If you can read this, you're being pinned!" I had taken great pleasure in pointing that particular sign out to one of my unfortunate Hogue opponents. With Charlie, however, that fear of mine proved unfounded. Brett, Charlie and I would become inseparable for the next two years, engaging in a wide range of debauchery and hijinks fueled largely by our daily pot smoking habit -- a habit we picked up from Charlie's big brother Dave. 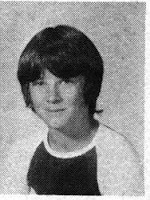 At the time, Charlie's older brother Dave was a high school junior. He was smart, strong, and a good guitar player. He (and his friends) not only introduced us to the pleasures of marijuana, but also to a wide range of new music, including progressive rock and jazz fusion. At that time, Dave had also begun regaling us with fantastical stories about miracles and swamis which he was reading about in some strange book. One night, after hearing one of these tales, I went home and recounted the story to my mom. She went straight to her bookshelf and pulled down the same, strange, orange-covered book I'd seen Dave reading. "Is this the book," my mom asked. "Yes, that's it!" I was dumbfounded. It seemed miraculous that she had had it. The book: Autobiography of a Yogi, by Paramahansa Yogananda. Though it would take a few more years for the significance of this event in my life to come to full fruition, the die was cast as soon as I cracked open the book and began to read its first page. On October 18, 1981, I got the word that Sri Chinmoy had accepted me as one of his disciples. I was 16, a junior in high school. Young as I was, the story behind my applying to join what some in my family believed -- perhaps correctly -- to be a Hindu religious cult stretched back a few years and is a story of happenstance, serendipity and interesting personalities. Over the following nine years of my discipleship, I would meet some of the most unique individuals I've ever met and I'll do my best to draw attention to them as my story unfolds. First, though, I want to acknowledge my boyhood friend, David Moretti (pictured above). Dave was my best friend through grade school. His father worked for the Almaden winery when there were still vineyards in Silicon Valley, and his mother worked for a local bank. Unlike my parents, Dave's mom and dad hadn't divorced. I spent just about every day after elementary school hanging out at the Moretti's house. When the whole family was there, it could get loud. Dave had two older brothers -- Mike and Mark -- and disputes between rival football teams (Dave, Mark and Mr. Moretti were partial to the Dolphins; Mike and I liked the Raiders) could devolve into a physical fracas on the floor of their living room, usually between Mr. Moretti and his oldest son, Mike. It was scary and fascinating. In the summers, Dave and I would spend the days riding bikes or playing football or baseball. On one memorable day, Dave and I were tossing a football in the front of his house. I ran a post pattern that took me down his driveway, across the street and then back onto the lawn of the house across the street. Dave timed his pass perfectly, hitting me just as I crossed onto his neighbor's lawn. I brought the pass in for a touchdown and began my end zone dance. Before I could really get my celebration dance going though, I heard Dave scream, "Joe, look out behind you." I'd never heard of a Rottweiler before that day, but one was fast approaching me with its fangs bared. Like my Oakland Raider hero Cliff Branch I was at top speed and dashing back across the street like I'd been shot out of a cannon. As Dave and I lay on the floor of his kitchen panting and laughing a few seconds later, I could still hear the faint echos of the dog's snapping jaws at my heals. As it turned out, the guard dog belonged to Dave's new neighbor: Joseph Bonanno. There were no hard feelings though. Mr. Moretti walked a case of Almaden wine over to the Don's house to welcome him to the neighborhood, and later we'd often see the old man watering his lawn. Unfortunately for us, however, we'd lost some good football real estate. As Dave and I reached our teens, we began to drift apart, though we'd remain friends through our high school years. Before that happened, however, Dave did something extra-ordinary, something that was to shape the way I looked at myself and also the way I judged the character of others I was to meet in the years ahead. Late one afternoon, Dave and I were walking through the grounds of our elementary school when nobody else seemed to be around, when we were accosted by a neighborhood tough who pulled a knife on me and held it to my throat. I was scared and crying and felt helpless. The guy was a high school kid; Dave and I were 10 or 11 at most. Seeing my situation, Dave pleaded with the guy to take the knife off me and instead put it to Dave's throat. The guy listened, and after holding the knife against Dave's neck for a while, the guy finally let us go. Through the course of my later life, I would meet some truly unique and noble individuals -- some of whom I'll try to profile as this story continues. None, however, surpass David Moretti, who as a 10 year old put himself in danger in order to help a friend. On Sunday night, October 14, Jeevan and I walked past Guru's open casket at the appointed hour. 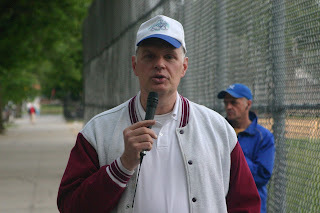 Afterwards, as we had done the night before, we mingled outside the tennis court with our many friends. It was then that I sat down with Sahishnu (pictured above, in race director mode) and he told me about Guru's last hours. According to Sahishnu, on the night of Wednesday, October 10, 2007, Guru had a meditation at the tennis court. Aside from being Wednesday night -- an historically important night for Center meditations -- it was also the night before the Nobel Peace Prize was to be awarded, an award long cherished by Guru. At the end of the meditation, Guru asked for volunteers to stay for a few extra hours, after he had left the tennis court, to meditate at the court with the Peace Prize in mind. Eighty-five disciples volunteered and Guru then went home. Sahishnu, and Guru's other masseuse Kamalakanta, followed. Sometime after midnight, Sahishnu said that something scary happened. While he was massaging Guru, a sudden expression came over Guru's face. Sahishnu said that it lasted perhaps 10 seconds or so, but he said Guru looked very frightened. Sahishnu said that he had never seen Guru appear so scared and so totally out of control like that before. It was over, however, just as quickly as it had started. As Guru came to, he asked that prasad be brought. All of this occurred upstairs at Guru's house. Apparently, the downstairs living room area, where we'd gather to watch TV at the house back in the day, is now too crowded with various pieces of exercise equipment, so Guru and the disciples congregate upstairs. In any event, after prasad, everyone left the house except Sahishnu, Kamalakanta, Ranjana, Govinda, and Paree. Once the others had gone, Guru asked Sahishnu and Kamalakanta to start vigorously massaging his chest in a downward motion. Sahishnu demonstrated this for me as he spoke by pushing down from his chest towards his abdomen and waist. From Sahishnu's description, this went on for some time, then Guru asked them to work his neck and the back of his shoulders. Sahishnu said that he and Kamalakanta were really working hard -- to the point of sweating. Sometimes they were working in unison on Guru's chest or back, while at other times they were working separately, with one doing Guru's chest and the other doing Guru's neck and shoulders. This went on until around 2:30 a.m. on the morning of Thursday, October 11. At that point, Sahishnu (and everyone else, I think) left. Sahishnu remembered Ranjana stopping her car alongside him as he began walking home. He pet Ranjana's dog, then he and Ranjana waved good night to each other. That, apparently, was the end of Sahishnu's direct knowledge of events. Sahishnu went on to relate that Ranjana was seen speeding to Guru's house at around 4:30 a.m. (I think that's what Sahishnu said). Then, around 6:30 a.m., Guru suffered the fatal attack. The only other piece of information I picked up -- and this might not have been from Sahishnu -- was that paramedics were called. Sahishnu's account was heartfelt and sobering; his eyes were moist and red throughout. I've got lots of reasons to be grateful to Sahishnu. The first time I visited New York -- August celebrations 1982 -- he let me crash in his room for a few days. Later, at the Smile, he set an example for me of how to man up under difficult and demanding circumstances, an example I've never forgotten. I am especially grateful, however, that he shared his time with me that Sunday night last October. Twenty-six years after he had accepted me as his disciple, Sri Chinmoy passed away at the age of 76. My good friend Sudhir Gilbert called me at work on the morning of October 11, 2007 to give me the news. I had just arrived at the office. Sudhir said that he, too, was at work. Apparenty, Guru had had a seizure of some kind and had died early that morning. Sudhir and the other workers at Victory Factory were closing down for the day. Sudhir said he'd call me when he'd heard more. I thanked him, hung up the phone, and moved to my office window, which looks out south and west from downtown San Diego towards the San Diego Bay, North Island, and the Pacific Ocean. I had a sense of finality, of moment, but no sadness. I called my brother Jeevan in Santa Cruz first and left a voicemail. I then called my sister Nirbachita in Puerto Rico, who picked up. I don't remember what was said or her reaction, other than surprise. It was a short conversation, though, and with it over I sat down in a chair by my window, with the door to my office closed. I went through an exercise I had done before when loved ones had passed away from me. I tried to remember the significant moments in my relationship with Guru -- to bring them before my eyes, to feel the emotions as I had experienced them so long ago -- one by one. Like the day 26 years ago, when as a 16 year old high schooler, I'd received the word I'd been "accepted." Or seeing Guru for the first time in person just a week or two later in Santa Barbara. Or the first words he spoke to me; the first conversation. Or sprinting frantically to Progress-Promise after having overslept a function, only to see Ranjana's car slowly heading up the street in my direction -- the car stopping only long enough for Guru to hand me a paper bag of prasad. Getting my name. Meditating at Rutgers. So much had happened since then. I had struck out on my own after nine years. I joined the Navy. Got married and had a son. Finished college and graduate school. Had a daughter. Went to law school, became a trial lawyer. Still, the memories of those years were alive, as was Guru's presence to me. Though I've often missed my brother and sister disciples, I've never missed Guru, who always seemed near. The same was true that Thursday morning.